“Bots are the new apps”, said Microsoft CEO Satya Nadella at the BUILD Developers Conference in San Francisco during a keynote where he was highlighting the evolution of human interaction with machines. Gartner has also predicted that 85% of all customer service interactions will be powered by chatbots by 2020. In the same report, Gartner has also highlighted that 30% of web browsing will be done by voice only. Every business worldwide has been focusing on the digital channel for the past decade or more. The first step towards creating a new company has now become the website, while many have already rolled out mobile applications too. Obviously, these digital properties serve your burgeoning customer base by increasing brand awareness and driving customer engagement at very low costs. All your efforts to build a digital property were initially aimed at standing out amongst competition or providing superior customer service. With the rise of innovative technologies, companies today are looking for new opportunities to serve customers better at lower costs. One such technological advancement is a Chatbot. Chatbots are conversational interfaces for businesses to make intelligent decisions leveraging Artificial Intelligence, Natural Language Processing and Machine Learning. Chatbots are an efficient way for people to access information really fast without having to go through multiple app screens or webpages to solve queries. Customer service is a key area where brands have a chance to develop a long-term relationship with their customers. HubSpot in its consumer study observed that 40% consumers don’t bother if a chatbot or a person is answering their queries. Moreover, 47% have expressed their keenness to buy goods via chatbots. 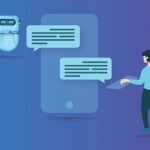 Compared to a customer care rep, chatbots are more effective in solving your queries by streamlining information flow and getting to the information faster. New age chatbot platform can replace humans from mundane tasks by providing a faster solution to customer queries, thus helping companies save millions. 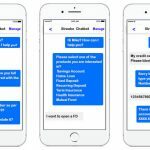 Juniper research has predicted that companies would be able to save over $8 billion annually through Chatbots.Humans can thus work on more important tasks or handle tougher customer queries as basic and repeated queries can be handled by a bot. Why not leverage Artificial Intelligence to make your business smarter? Imagine what would be happening when users visit your application or website and are lost in the labyrinth of links that are available on the screen. There are high chances that an unhappy customer would switch to your competitor if he finds that there are other trustworthy options for solving queries. Providing customized offers to customers based on their buying behavior and personalized attention would ensure happy & loyal customers, thus leading to higher revenues. Chatbots are the future of customer service. It will revolutionize the way customer interactions are taking place in several industries today. Leading companies like IBM®, Microsoft, Facebook and Google are already investing heavily in AI platforms like IBM® Watson, Google Allo, Amazon Alexa, Microsoft Cortana. Leading Enterprises like CNN, Uber and Dominos have started integrating chatbots on their websites & apps to serve the customers in a better way. You can also offer these chatbots to your customers via Facebook Messenger, Whatsapp, Slack and many other social media channels. 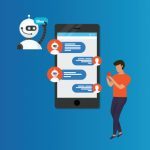 If you are in the services business and looking to improve your customer engagement further, you should surely think about investing in Chatbots. Implementing Chatbots will not only work in the favor of your business by streamlining rigorous work processes but will also provide your personnel with a chance to do something more productive for the organization. And lastly, the ultimate goal of customer satisfaction can be attained in no time. It’s now your call whether implementing a Chatbot is in your business’s gain or not.